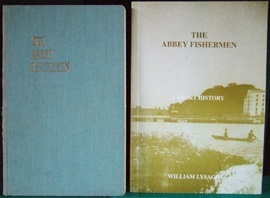 In 1964 William Lysaght published a book "The Abbey Fishermen - A Short History" The author tells the history of the snap net fishermen of the Abbey area of Limerick who found themselves deprived of a livelihood with the installation of the hydro-electric scheme at Ardnacrusha in the late 1920's. The book first published in 1964 by the Treaty Press 6/9 Georges Quay, Limerick. Second Printing 1999 by Shamrock Stamps, Gerald Griffin St., Limerick. In a bungalow at the end of the Mill Road, Corbally, directly across from St. Thomas's Island, there William (Nay) Lysaght (1918-1992) lived the greater part of his life. Being familiar with many of the old Abbey fishermen, who liked to visit the scenes of their former labours, he often went boating with them in the brocaun. Besides, his uncle, Arthur Lysaght who used to have a hut nearby was a veritable encyclopedia on the Abbey fishermen, and Nay listened attentitively to him, thus he became an expert on these fishermen, and what is more, all this information which he gathered over the years, he wrote down. He also made a very realistic and accurate model of the fishermen as they fished with their net "down". In its glass surround it is worth seeing as it illustrates in a way no description can, their method of catching the elusive salmon. It is on display in a Museum room attached to St. Mary's Roman Catholic Church, Athlunkard Street. Two Abbey brocauns approaching a draught (or draw) at Corbally, March 1932. Background: (left to right) Paddy Hayes, J. Clancy (Sugans). Foreground (left to right): Bud Clancy, Father Clancy. It is 10 a.m. on a cold morning in March in the 1840's. The crews of two brocauns have just finished fishing at Tarnacreeba near the Metal Bridge. The men are cold and hungary, but what matter, its only a short run home to the Abbey and 7 or 8 beamy salmon lie on the bottom of one of the brocauns. Home now for a few hours sleep and net repairs. It's evening, they must face once more the long journey back to Doonass the topmost inure. The river is in spate, so it's poles out at Amor for the hard push through the Queen's Gap at Corbally and on to Braur and Smithaun up by Poulahera to Cragrack by paddle, then the poles are out again for the long haul through Drominbeg, Tannyvour, the Dam, Bunabha, Lurriga, Geentass, Barnaluinge and now they must start to work downstream again. This photograph according to William Lysaght's knowledge is the only extanct photograph of a pair of brocauns with the net spread in the act of fishing. 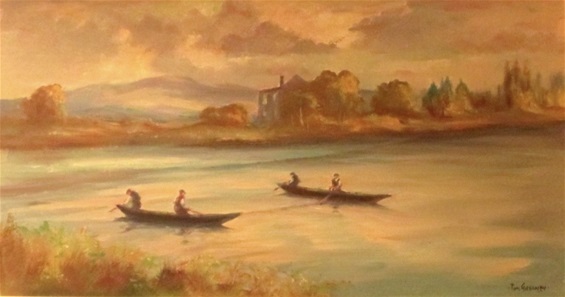 Notice that the two paddlemen are facing and paddling downstream, thus dragging the net after the brocauns which are proceeding downstream, stern first. The netmen in the bows of the brocauns have their backs to the paddlemen, these were the positions for fishing. When going upsream with the nets in the brocauns the men faced around. The Abbey fishermen used several different types of snap nets varying in length and depth. 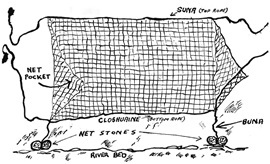 A typical net would be 39 feet in length and 56 meshes deep, meshes measuring 4 to 6 inches. The net was mounted on 2 ropes, the top rope was called the SUNA and the bottom one the CLOSHUINE. On the bottom corners of the net there was a short length of rope called the BUNA, the netstones were attached to this. The stones had grooves in them to save undue wear on the ropes, as they were dragged over the bottom of the river. THE NET STONES were made of limestone and had grooves cut in them to save the ropes from undue wear as they were dragged over the bottom of the river. 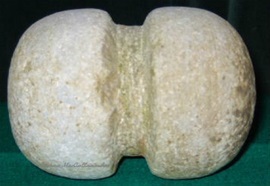 The net stones varied in weight for use in different river conditions, but an average weight was 2 pounds. 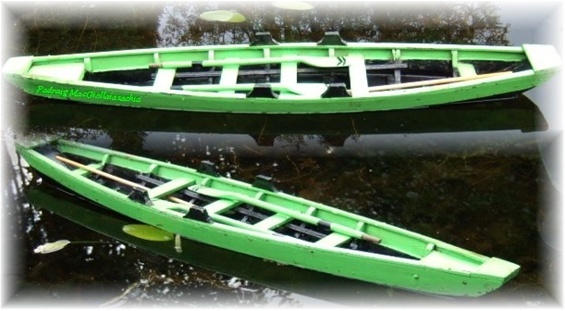 The brocaun was a flat bottom boat, a type of cot peculiar to the Abbey fishermen. It was a slimmer, shorter and lighter version of the angling cot. This miniature model of an angling cot was made in 1951 by Patrick (Randy) Hayes, an ex Abbey fisherman and boat builder. The angling cot was modelled on the lines of the brocaun. This drawing is a rough idea of how the net would have looked under water as it is being dragged behind the brocauns. THE ASH POLE was 10 to 11 feet long and about 2.5 inches in diameter, it had an iron furrule at the end. THE PADDLE had an Oak blade and Ash handle. THE SOPS were hay ropes or sugans. The fishermen wrapped them around their legs to keep out water. THE CRIOSTOIR was used for killing fish. It could be any piece of heavy wood with a thong attached. 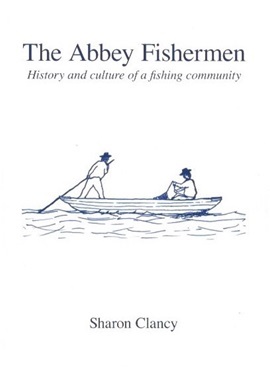 In 2006 Sharon Clancy published an excellent book "The Abbey Fishermen" History and Culture of a Fishing Community. 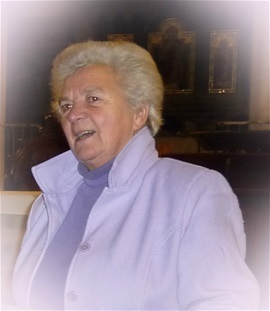 Sharon dedicated her book to the Abbey men who for centuries made their living from fishing on the Shannon river. 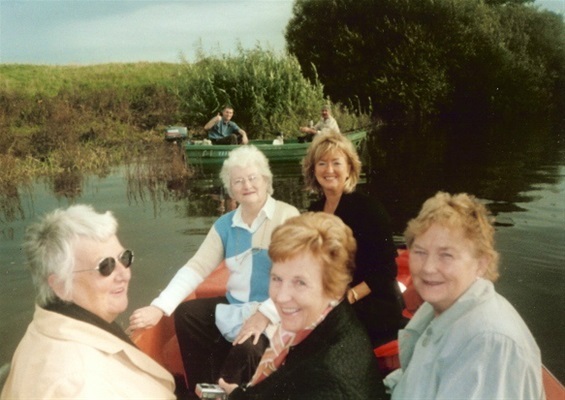 Clancy sisters nostalgic trip on the river Shannon at Corbally. Daughters of Jackie Clancy, Abbey Fisherman and author of "My Life on the River". Front: Margaret Downey, Delia Cowles and Marie O'Flaherty. Back: Ann Matson (cousin) and Teresa Cierans. 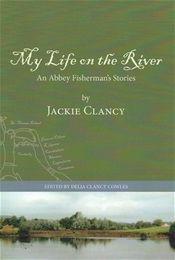 A wonderful book My Life on the River - An Abbey Fisherman's Stories by Jackie Clancy, edited and published in 2010 by Delia Cowles. 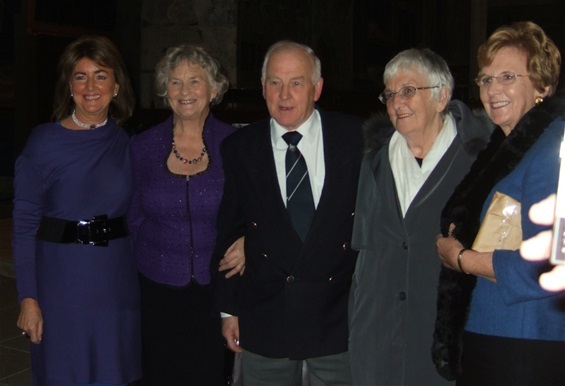 The Clancy family at the launch of their fathers book "My Life on the River" at St. Mary's Cathedral, Limerick. From left: Teresa Cierans, Marie O'Flaherty, Jimmy Clancy, Margaret Downey and Delia Cowles. And the gandlow race where more were pipped. And what a wealth of knowledge his presence brings! Where virile men strong muscles yield. And for characters rich we're now bereft. 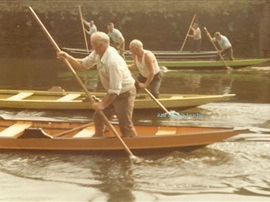 VETERANS POLING RACE - Abbey Regatta 1977. In front boat: Thomas (Tawdy) Clancy for whom Maureen Sparling respectfully dedicated her poem The Old Abbey Regatta to his memory. Tawdy collapsed and passed away in 1979 while doing what he loved, competing in a poling race in a regatta. In the yellow boat is Tawdys brother Jackie Clancy, author of My Life on the River - An Abbey Fisherman's Stories. In the green boat is William Lysaght author of The Abbey Fishermen - A Short History. AUTHOR AND POET MAUREEN SPARLING. Maureens published works include: Echoes of Old Limerick (Poetry), Happy Moments (Poetry), Reflections of Life (Poetry), Tales from King's Island Cottage (3 Novellas), Ripples in the Sand (Poetry), The Gold Nugget (Short Stories), A Gem in the Wasteland (Poetry and CD), Revenge of the Innocent (Novel), A Dubious Destiny (Novel). THE ABBEY BRIDGE By Maureen Sparling 1999. For, all on this earth, in mind were not the same. Alerting all present, excited the crowd. With none of them downcast, as all seemed quite chipper. Peri, Todsie and Smutts, the Iron man to be feared. Brass Bands, Pat the Thatcher, Jones and Tucker we knew. Said Jim then to Jan, "I think you look worn,"
And I'm guessin' 'tween me and the people you're torn. And is it foolhardy to create such a rift? You'll observe things I'm sure in a far different light. Apologies abounding for all the confusion. In April 1925, the crew of the Shanny family caught the biggest fish ever caught in Irish Waters. It weighed 62 1\2 lbs. The poem featured above is taken from a collection of poems entitled, " A Gem in the Wasteland" published in 2002. A lovely selection of Poetry Books by Maureen Sparling - Ripples in the Sand, The Golden Nugget, Echoes of Old Limerick, Happy Moments, Reflections of Life, A Gem in the Wasteland. Thank you George, good idea, so added it in. Hi Ann, this is fantastic. I have a copy of the original "The Abbey Fisherman" by your dad, which I treasure. I remember being in The Treaty Press as a child. hi Ann, my mum used to tell me a lot of stories of what went on during the time.